Israel began moving tanks and other armored vehicles into Gaza. Israeli Defense Minister Ehud Barak has called up 30,000 troops to prepare, amid speculation of possible ground offensive in Gaza. This announcement came out after a rocket fired by Palestinian militants from Gaza to Tel Aviv. 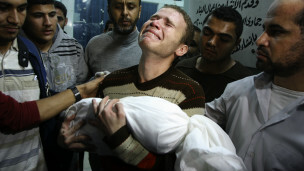 The fighting has increased since Israel killed Ahmed Jabari, Hamas military leaders who control Gaza, Wednesday (14/11). At least 18 Palestinians in Gaza killed in Israeli air strikes, termasul children, and three Israelis were killed due to Palestinian rocket fire into southern Palestine. On Thursday night, Hamas said it had fired more than 350 rockets from Gaza, which Israel called 130 of them managed to be intercepted by anti-missile defense system Iron Dome. But in Tel Aviv, residents took shelter after air raid sirens sounded due to the threat missile's first in the city since 1991. One missile landed in an area not inhabited while another fell in the sea. The military wing of Islamic Jihad said they had fired an Iranian-made rockets, Fajr-5, which has a distance of about 75km. Most of the casualties in Gaza are civilians and children. Thursday morning, a BBC correspondent in Gaza reported a huge explosion and fire missiles around Gaza City as Israeli airstrikes continue. There are also reports that the bus containing Israeli soldiers and trucks carrying tanks and armed personnel, walked to the beach. A number of Israeli television channel said the troop surge shows a plan of attack, but military officials said no decision has been made. Hamas prime minister in Gaza, Ismail Haniyeh, condemned for what he called a "vicious attack" Israel's territory. "We in Gaza will remain steadfast and immovable"
Palestinians killed in Gaza in two days of Israeli air strikes and naval gunfire were mostly civilians, including at least four children, one of whom is the son Jihad Misharawi, picture editor BBC Arabic. While the three Israelis killed were two women and a man were killed by a rocket attack in the southern town of Kiryat Malachi. Egyptian President Mohammed Mursi said attacks new Israeli aggression as'' unacceptable'' and said it would disrupt stability in the region. Egyptian Prime Minister Hisham Qandil also went to Gaza on Friday (16/11) as a form of support. During this active Cairo including the mediate Israel and Hamas in battle. The U.S. as a key U.S. ally, has urged Egypt, Turkey and the European countries that have ties to Hamas to encourage the group to stop serangfan rockets from Gaza, saying the responsibility is on Hamas to stop the attacks. Arab League foreign ministers will hold an emergency meeting on Friday (16/11).